This weekend I had some time and energy to power up the amateur radio set and trying to get interesting contacts. All in FT8 digital mode as the local interference levels are high. I do my voice contacts at the radio club or out in the field. This Saturday I managed to make a contact with 5T2AI on Mauritania, a new country in amateur radio for me. At first the other station did not receive me but using the power amplifier helped to make the contact. I also did a lot of attempts to get a contact with the current radio expedition to Rodriguez Islands but failed. Er was een stroomstoring afgelopen dinsdag. Ik ontdekte dat op een hele typische manier: ik werd wakker voor de tijd van opstaan, wat me wel vaker overkomt en ik wilde op de wekker kijken maar die was donker. Uiteindelijk was de stroomstoring van 06:23 tot 08:07, in een aardig gebied rondom ons huis. Helaas was er in de ochtenddrukte geen tijd om te testen wat het gevolg van deze uitval was voor het storingsniveau op de amateur radio HF banden. My amateur club Veron A08 call PI4UTR has a really good clubstation with multiple nice antennas. In an environment with a lot less interference than I have at home. Last Tuesday I used the clubstation to make a few connections and got some nice calls in the log, adding two new countries. VP8LP on the Falkland Islands and CE2ML in Chili. The HF linear amplifier I bought had one missing link: the control cable to signal when to start transmitting. I first looked for such a cable at Hamshop but the cable was not available anymore. Further searching found the right cable at 8 pin linear amp switching cable for Yaesu FT-817 FT-857 FT-891 FT-897 FT-991 - TechnoFix UK and ordered it. It came in, so time to test it in the upcoming weekend. Last Friday I had time available for outdoor radio and the weather prediction looked nice. Fellow radio amateur PA5Z had time available too and joined me. We cycled to the local park and found a nice spot for some radio, complete with a bench available to sit and run the radio. First decision was which band, because changing the band after raising the linked dipole means having to take it all down again. It was a tough decision between 40 and 20 meters, both looked not too promising. We decided on 40 meters. I also extended the mast and tie-wrapped the balun of the linked dipole to the mast (three segments below the top) before getting the mast upright. This worked nicer for me on an earlier setup. The downside is that we had to be very careful in where the guy-wires and the dipole wires are around the fiber mast to avoid tangled lines and twists. And the right way to lengthen the mast is twisting the segments to lock them together. With two people it is a lot easier to get the mast straight and it looked very nice. Soon contacts were made, but after a few tries I received a report that the audio sounded like I had RF interference. I heard this remark before at the end of my testing the mast at Trintelhaven and this time I found out what the problem was: the lead-acid battery I was using was running low and when the voltage drops from 12.0 to 9.6 volts on transmitting the output gets distorted. The fix was to lower the output power, a local radio amateur who we contacted was willing to help test this and confirm my theory that the drop in voltage was causing distortion. Eventually it started to rain a bit, the batteries started to get depleted even at lower power and we decided it was time to pack up and go back home. A nice day for radio, I ordered a new battery to replace the failing ones and I'll be doing this again some day! As planned and prepared for I participated in the SCC RTTY contest this weekend. I was aiming for 100+ contacts but due to local interference and not very cooperating propagation those did not happen. 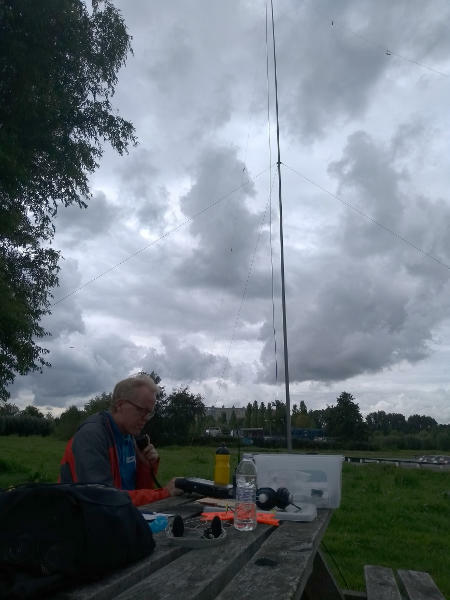 In the end I made 83 contacts, 2 on the 40 meter band and 81 on the 20 meter band. I entered in the 'single operator 20 meter' category which was the most fitting for me. That does mean the 2 40 meter contacts only count for log checking. Interesting things that happened: I got YV5AAX in the log. This has happened before in RTTY contests. But I do see YV5AAX from time to time in FT8 but never made a contact in that mode. I guess the station uses different antennas for contests. I also worked several US stations but I don't think those have resulted in a new US state for my statistics. The new amplifier was working fine although I noticed the fan control and fan in the power supply stopped completely when I transmitted RTTY in the 10 meter band. This was not a very big problem this time as there was no propagation at all on that band. But it will have to be fixed before the next contest. With this amount of power I can work almost all stations that I can decode. That is a nice improvement! This page generated by $Id$ in 0.004273 seconds.